Moncreiffe Island, also known as Friarton Island, is an island in Perth, Scotland. It divides the River Tay into two channels as it flows through Perth, and is crossed by the railway line to Dundee. Moncreiffe House was built in 1679, by the architect Sir William Bruce. It incorporated an older tower house and burned down in November 1957, claiming the life of Sir David Moncreiffe of that Ilk, 10th Baronet, the twenty-third Laird of Clan Moncreiffe. This tragedy led to the chiefship of the great Scottish herald and historian Sir Iain Moncreiffe of that Ilk, 11th Baronet. Allotments belonging to The Perth Working Men's Garden Association. The King James VI Golf Course is situated on and covers much of the island with the remaining land used for allotments. 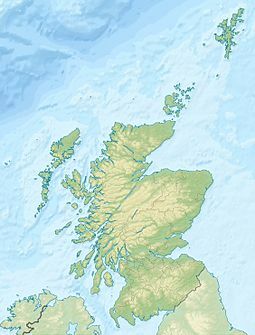 At the 2011 census, it is the only permanently inhabited freshwater island in Scotland which is not on Loch Lomond. There are wild garlic, common bluebells, sweet cicely, broom and dog violets. ^ "Scottish Clan Names: Moncrieffe". Perthshire-Scotland. Retrieved 24 August 2007. ^ "Wildlife on Tay". Archived from the original on 7 September 2007. Retrieved 24 August 2007. Wikimedia Commons has media related to Friarton Island.